I had to make a cake for nephew’s 8th birthday and wanted something easy as I was very busy with work, so I decided to make a Manchester United football birthday cake as he is a fan. I made two sponge cakes, one ten inch round one and the other I made out of a basin. I purchased a red 12 inch board and a few rice cake stickers of ManU log . I added jam and creamed the bottom cake and then covered it in green icing. I cut out and jammed the centre of the pudding basin cake and trimmed it to shape. I covered the basun cake with buttercream and set it in the centre of green iced cake. Then, using a hexagon cutter, I cut out white and black shapes and covered the ball shape using alternate colours to make it look like a football. I made grass from a garlic press and pasted it around the ball. I then added the rice cake stickers on the ball and some on the side of the cake along with a few stars. I even added a few chocolate footballs on to board just to enhance the effect. I finished off the cake by placing a boy football player on the top. I made the player with dirty knees and face. I added eight red and white candles. 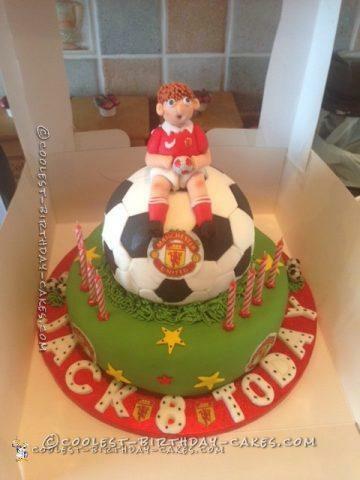 There you go – a Manchester United 8th Birthday Football Cake that was enjoyed by all.